Le Clos d’Alesia i Paris, Frankrike : Boka nu! 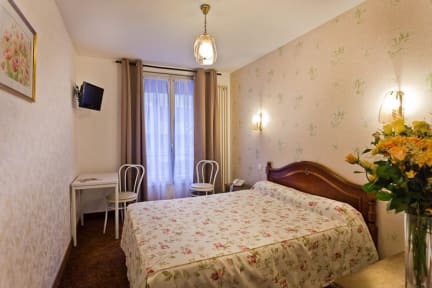 Le Clos D'Alesia enjoys an ideal Parisian location in a peaceful area close to the bustling street of Alesia, Parc Montsouris and Avenue Leclerc duGeneral. Guestrooms of this charming hotel are well equipped with a variety of amenities including direct-dial telephone ,free Wifi, television, double-glazing windows, and bathroom with shower and/or bathtub and hairdryer. In addition, there are a number of on-site features including a delightful dining area with patio - which serves breakfast from 7am - 11am, a lift/elevator, fax machine, a beverage dispenser, available parking, and a friendly multilingual staff ensuring that all guests of Le Clos D'Alesia enjoy a pleasant stay in the French capital. Check-Out Time: 07:00 - 12:00 Cancellation/modified up to 18:00 on the day of arrival, no fee will be charged.